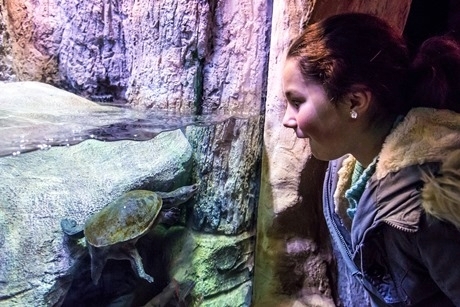 A school visit destination for students of all ages, the Sea Life centre has over 3,500 creatures and is the world’s oldest operating aquarium. The displays are designed to be engaging, educational and interactive; each demonstrating different marine environments and species. Students can interact with creatures in the rock pool, and attend a varied range of talks from Turtley Amazing to Jawsome Sharks! A visit can include the addition of a Discovery Tour where the group is accompanied by a guide. Plus, teachers can choose from a selection of workshops to enhance the trip, including My Special Aquarium and A Story of Survival. 10am: Meet and greet at the centre entrance with a member of the education team. After dropping off bags and packed lunches in the storage area there is a welcome briefing which outlines the day’s programme and how to get the most out of the visit. 10:15am: Pupils embark on the Discovery Tour and are shown around by a marine expert. Teachers can contact the centre in advance to tailor the tour to specific creatures or topics. 11am: Pupils explore the exhibits in small groups, with the opportunity to use worksheets or trails designed around specific areas of the curriculum. These are free website resources, which teachers can download and print prior to their visit. Topics include sea turtles, the rock pool, sharks, seahorses, clownfish and octopus. 12pm: Lunch break in the auditorium during the Breed, Rescue and Protect talk. In fine weather the beach, right opposite the centre, is recommended for lunch. 1pm: A Story of Survival workshop. During this fun, animated, reading session, children will take on the roles of different marine animals and learn the tricks they use to avoid predators. Workshops are led by members of the education team and include a mixture of song, theatre, arts and crafts and group discussion. Lasting 20 to 40 minutes, depending on the workshop, they are added to the end of a tour in order to help consolidate what children have seen and learnt in the aquarium. Other options include My Special Aquarium, which encourages children to talk about the different creatures they have seen at Sea Life then use arts and craft materials to create their own aquarium to take home. 1.45pm: More time to explore the exhibits and visit the gift shop.